New research, published today, revealed that one of the earliest inhabitants of what is now the United Kingdom had black skin and blue eyes. The first thought most people had, however, is that this is going to annoy a lot of racist people in Britain, who for some reason believe it has been white right from the beginning all the way through to 50 or so years ago. The first stop on any search for absurd reactions to this kind of news is the Daily Mail comment section. It didn't disappoint. 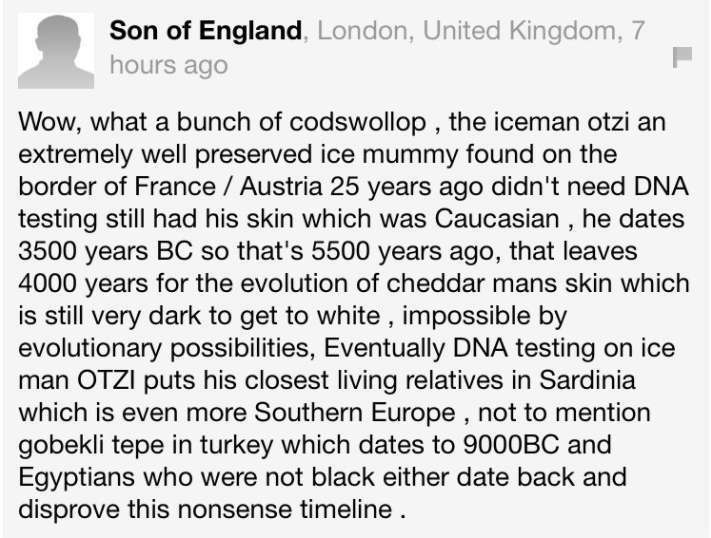 First up in the terrible takes department is Son of England, who thinks that because Europe also had white settlers over the years, no one with dark skin could ever be found in its history. Some fine logic there, Son of England. That was actually one of the least ridiculous takes. Next up, we had the astonishingly bizarre take that "you can't prove anything without a fricking time machine". You hear that, archaeologists? Geneticists? 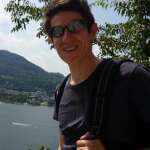 Down your tools – nothing is provable. Of course, there was the classic "It's political correctness gone mad". Perhaps scraping the bottom of the barrel the most, was this comment from my_personal_opinion. 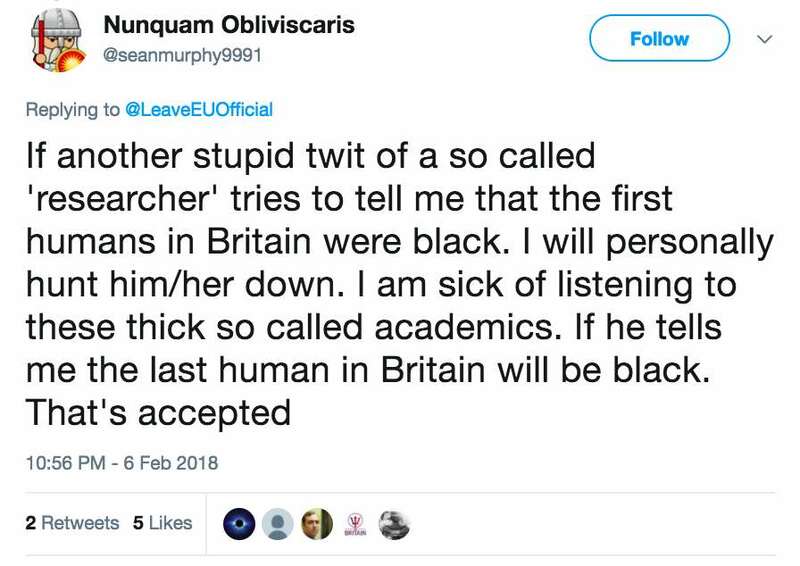 So desperate was my_personal_opinion to believe the first Britons were white, they suggested that maybe the Cheddar Man was merely here on vacation. Fortunately, he was the only person with such a weird view – wait, here's another. 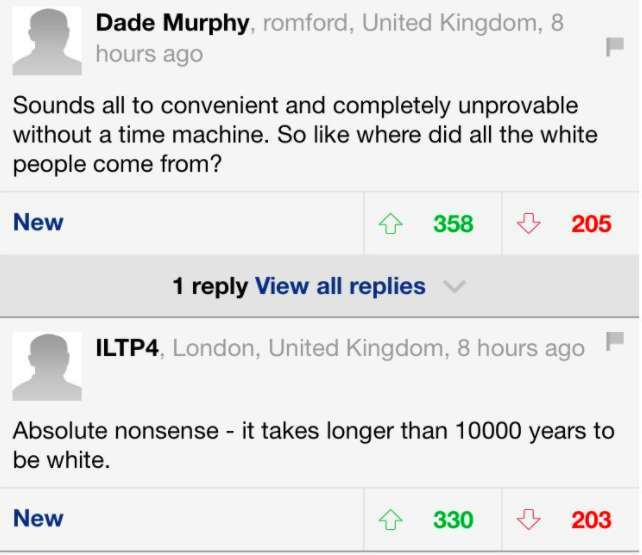 And in this confusing take, one person thinks there was no Sun back then. Outside the Daily Mail, there were, of course, other people saying nonsense that was just as absurd. "Why do I think this is made up to push a certain agenda?" writes one commenter on Twitter. The answer, of course, is because you're paranoid, racist, and stupid. 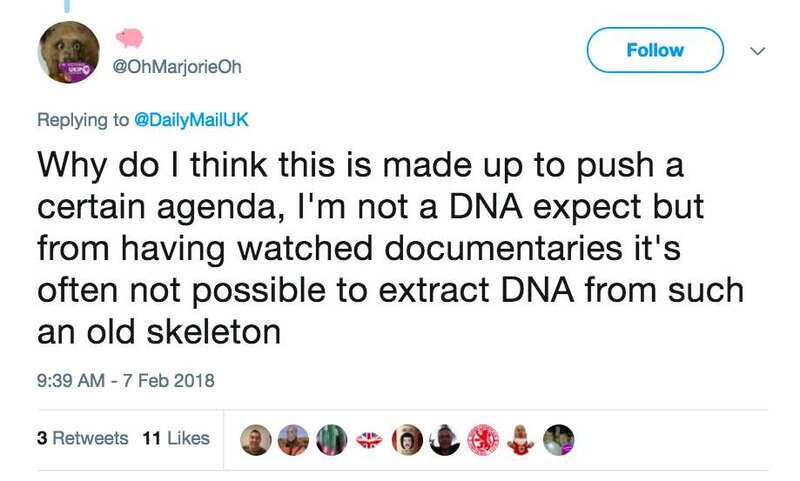 "I'm not a DNA expect [sic] but from having watched documentaries it's often not possible to extract DNA from such an old skeleton". The reaction to the story has been overwhelmingly positive. Some people used the opportunity to joke about Britain First, a far-right group in the UK, and other alt-right figures. Elsewhere, people welcomed the news as a reminder that we all came from Africa originally.